Cats vs Dogs: Which Pet Is The Best? The age-old debate concerning which animal is the best, cats or dogs, was brought back into the limelight recently as scientists proclaimed that cats are better at surviving. Although this is good news for one proportion of the nation, dog lovers, including us, will no doubt cover their ears and refuse to take the news lightly. So as the debate continues to divide opinion, we’re taking a look at what the main differences are between these two popular animals and stating why we think that dogs come out on top! Did you know that dogs are the third most popular pet to own in the UK? Our four-legged friends are sitting comfortably behind tank and pond fish, who take first and second place respectively. Where’s the fluffy feline we hear you ask, well they take the fourth spot after dogs. That means that if this was a podium finish, the cat wouldn’t even appear victorious on the stand. Statistics also highlight that between 2012 and 2014 there were nine million dog owners and 8 million cat owners in the UK, leading us to believe it’s the dog who is man’s true best friend. Protective, loyal, and easier to train, these three differences alone reflect some of the reasons as to why dogs make for great pets and why they should win the battle once and for all. So where do you stand? Do you agree with what we have to say, or have you always preferred cats over dogs from a young age? 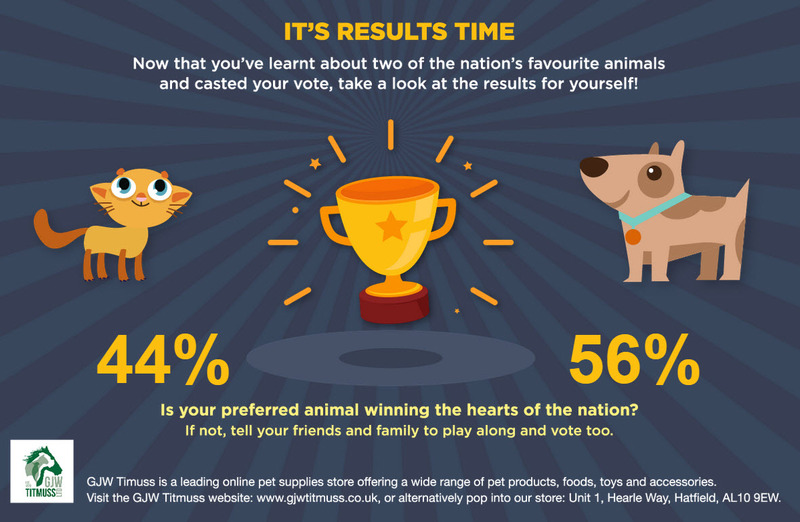 Before you cast your vote, take a look at this scrolling cats vs dogs interactive Infographic to help you decide. Once you’ve clicked on the cat or dog, you can view the results calculator at the end to see what the nation has to say. This entry was posted in Miscellaneous and tagged dogs by admin. Bookmark the permalink.